The Huong Son Buddhism complex was listed among national special relic sites in December 2017. 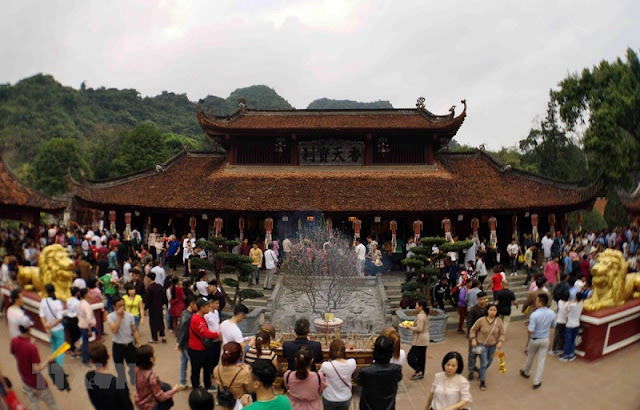 The number of visitors to Huong pagoda in the first three months of 2019 is estimated at one million, according to the organizing board. Head of the Management Board of Huong Son Cultural and Historical Site said 4,000 boats with more than 8,600 life vests have been put into use. In addition, security personel has handled more than 40 cases of violation of regulations during the festival in Huong pagoda. Chairman Nguyen Van Hoat of the My Duc People’s Committee where the pagoda is located, said that last year Huong Pagoda received 1.45 million visitors. The festival starts off in Huong Son commune, Hanoi’s outlying district of My Duc, on the sixth day of the lunar new year and lasts for three months. This year, it started on February 10. Visiting Huong Pagoda complex during the festival is a spiritual journey to the Buddhist Land. Visitors have sightseeing trips to pagodas, temples and caves which are the main attractions, and join ceremonies to ask for blessings from Buddha. In this year’s festival, trading activities were no longer seen in pagodas, caverns and roads in the complex. Over 300 licensed stalls were arranged reasonably in order not to cause congestion. A hot line of the festival’s organization board has been announced for visitors to report problems. Aside from its religious significance, the complex also holds special values in terms of ecosystem, landscape, architecture and history. The Huong Son complex was listed among national special relic sites in December 2017.